You know those days you just want to crawl under the covers and not face the world again? Or your best friend moves away? Or your candidate loses an important election? Those are the days I make a big pot of Hungarian Mushroom Soup, as it’s the perfect way to end a bad day. The slicing of the mushrooms and dicing of the onions allows you to get out your frustration, anxiety, or whatever is bothering you. 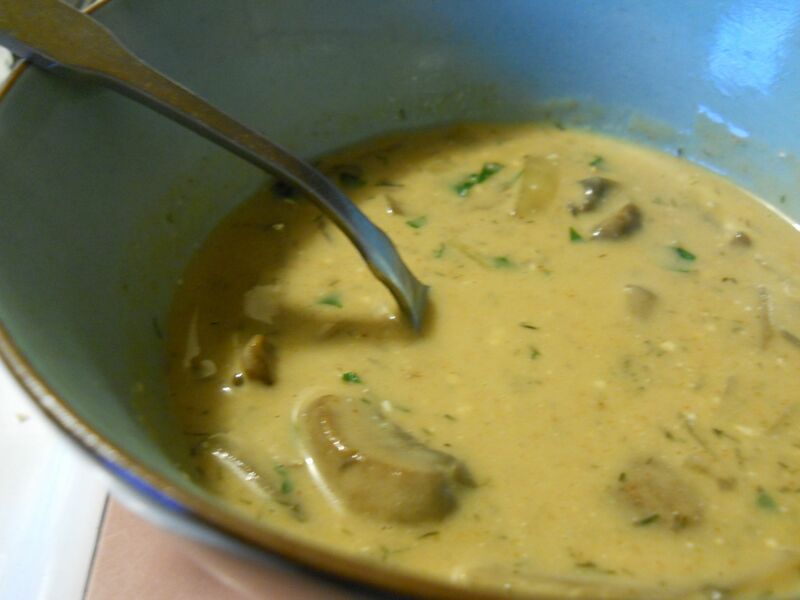 The soup harkens back to my Eastern European roots; it’s a comforting bowl of creamy soup with just the right amount of spice to make your nose run and nice big slices of mushrooms. If I’m feeling blue or feel a cold coming on, I’ll buy two boxes of mushrooms on the way home from work and right away I know where I’ll be that evening–hunkered over a steaming bowl. I discovered this soup when I ordered takeout for lunch one day. It was delicious and creamy, but as is my usual way, I knew I could find a way to make it cheaper than what I paid for a small takeout container. And I did. This recipe is originally from The New Moosewood Cookbook, but many years ago I found online a lower calorie and more flavorful version. So forgive me for not giving proper credit; I use the basic outline, but go off on tangents from there. Try making this soup over the winter when you have a case of the mean reds. Snuggle up on the couch and put on your favorite movie. Whatever is bothering you, trust me, you’ll feel better! 1. Sauté onions in a little bit of broth until soft. Add the mushrooms, 1 teaspoon of dill, ½ cup of broth, tamari, and paprika. Sauté and simmer for about 15 minutes. 2. In a small saucepan, add the butter. When melted, whisk in the flour to make a paste. Add the milk, and whisk over low heat until thick. 3, Add the milk mixture to the mushrooms as well as the remaining broth. Cover and simmer for 15 minutes or so. 4. Just before it’s done, whisk in the sour cream, remaining teaspoon of dill weed, parsley, and salt and pepper. I didn’t know you were a Romney supporter! I’m in need of comfort food today and this might just hit the spot! I know your recipe is far better than that red and white can kind, but I still have fond memories of creamy hot mushroom soup waiting at the table when I came home from school for lunch. A deli restaurant near us makes a great mushroom barley soup. Thanks for the comfort Chris. Carol, it it not beneath me to enjoy a bowl of the “red and white” can once in a while, I do love it and it hits the spot! If you make this, I hope you enjoy it! My library has a soup and bread tasting Saturday afternoon every January for the about the past four years. It is always a well attended event. At last year’s, one of our Friends members let me know that she couldn’t try anything because she was a vegetarian. This gives me a possibility. Oh, and I like the red and white kind made with water – hardly cream of. I’m with Richard, you sounded like a Romney supporter–teehee. This sounds great! I’ll give it a try.